My plans to take the caravan to Northumbria during August had to be put on hold because of some minor surgery that was needed. With follow up appointments and blood tests the earliest I could get away was early in September. The weather forecast looked reasonable so I tried for a 10 day booking at the CC site, The Grange in Durham. Unfortunately the second weekend was fully booked so I had to settle for less. Whenever I travel north, the first 50 miles is always on the M25 and to avoid the really heavy congestion, I leave home early. So on the Tuesday morning I was away from home by 6am. I travelled by way of the M25 and then the less busy M40. After a break at Cherwell Valley Services, I took the A43 across to the M1. Another stop was made at Woodall services, just before the turn for the M18. With a lunch stop at Wetherby services, I arrived at the Durham site around 2pm having done just under 300 miles. 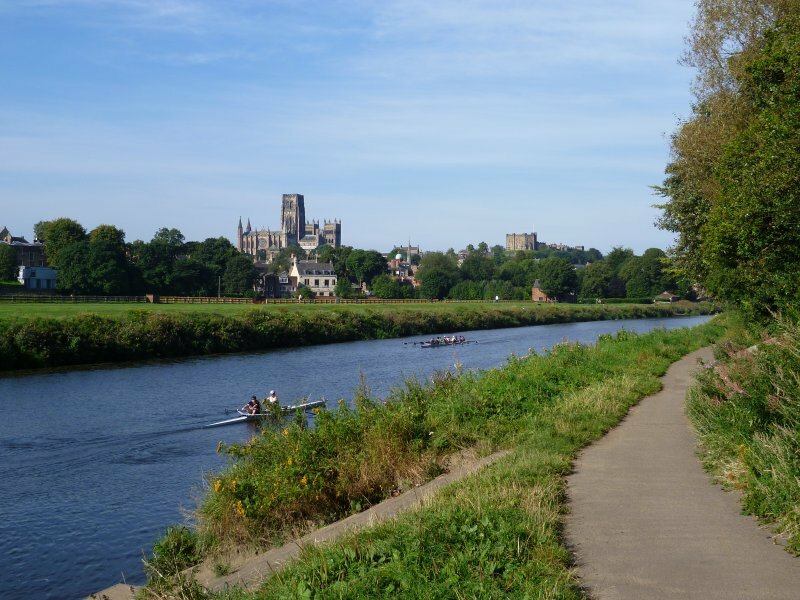 The Caravan Club site at Durham is very close to the A1, just off one of the main roads into the city. In fact Durham is just 3 miles away. Along the road, on the other side of the A1 intersection, there is one of the Park & Ride bus services which circulate through the city. 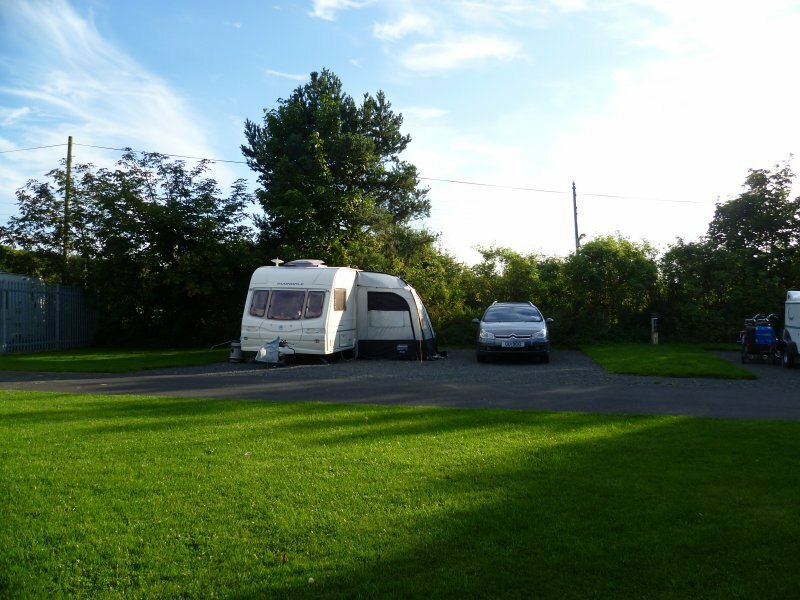 The Grange has a total of 76 pitches, some of which are hard standing and they are all on level ground. With only seven days at my disposal, I lost no time in planning my first excursion. 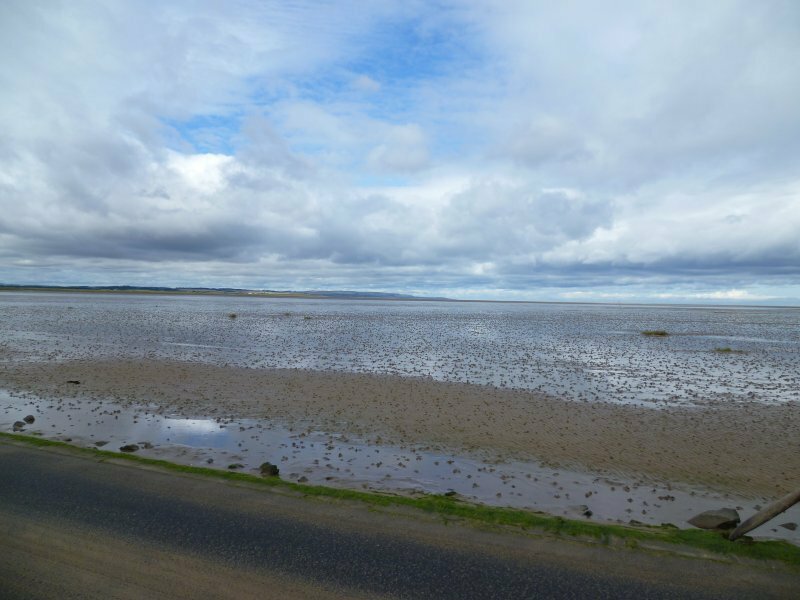 I decided on the 80 mile drive up the A1 to Holy Island. 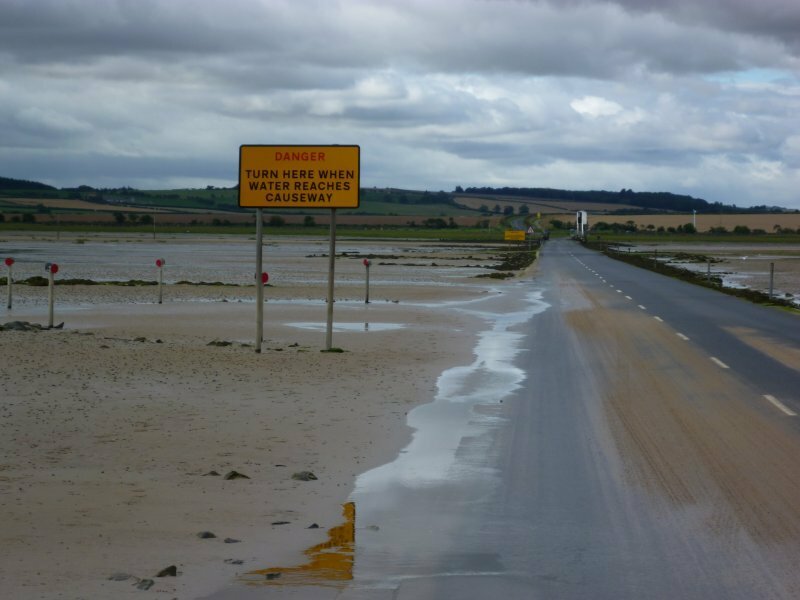 When making a visit to Lindisfarne it’s advisable to consult the tide charts because the one mile causeway to the Island may be closed with the road under water. 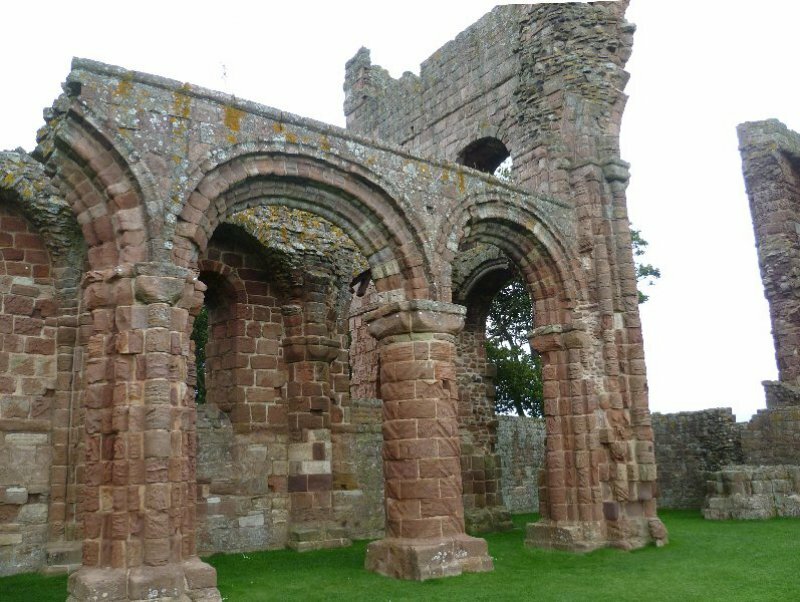 The monastery at Lindisfarne was founded by Saint Aiden in 634AD and he remained there until his death in 651. 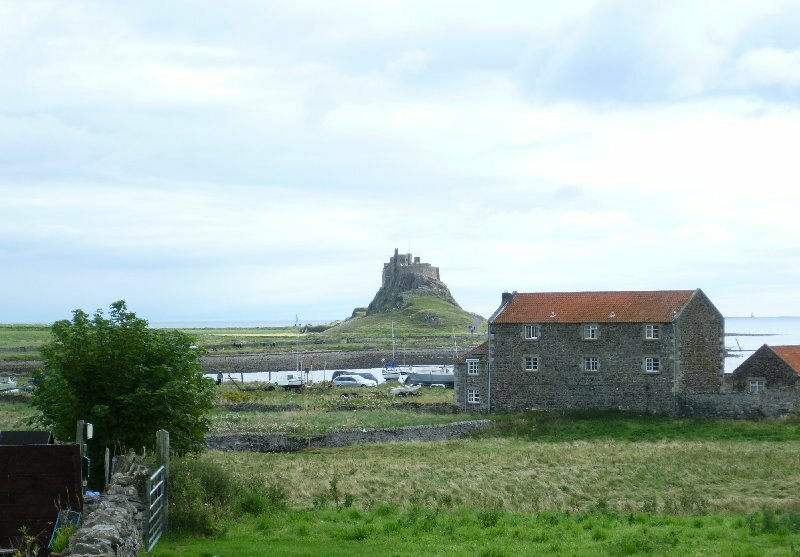 A few years later Cuthbert became prior and eventually was made bishop of Lindisfarne. 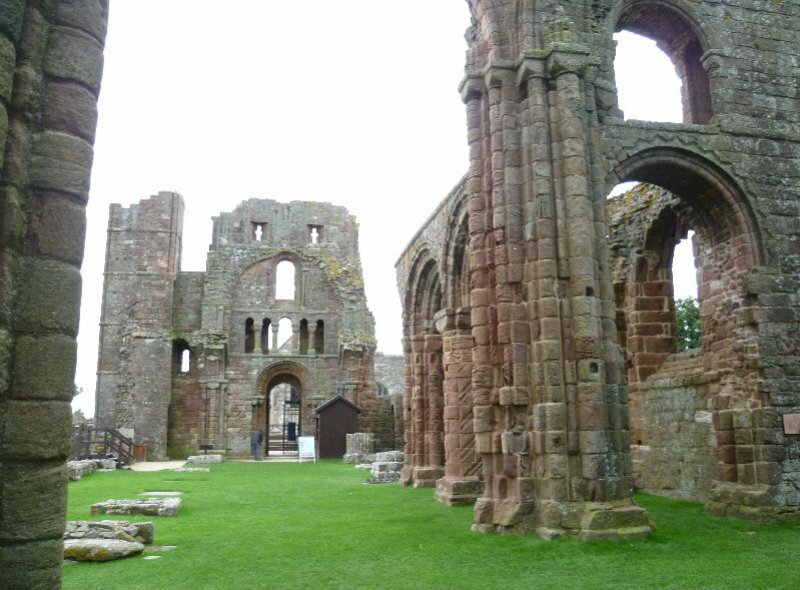 After his death he was buried at the Priory and he came to be regarded as the patron saint of Northumbria. 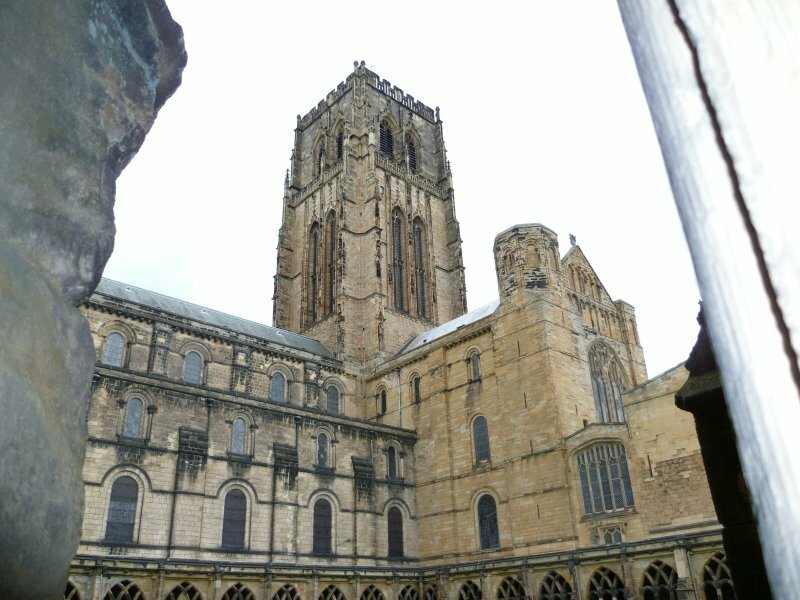 With the priory often being attacked and the monks murdered by Viking invaders, Cuthbert’s remains were removed and eventually re interred at Durham Cathedral. 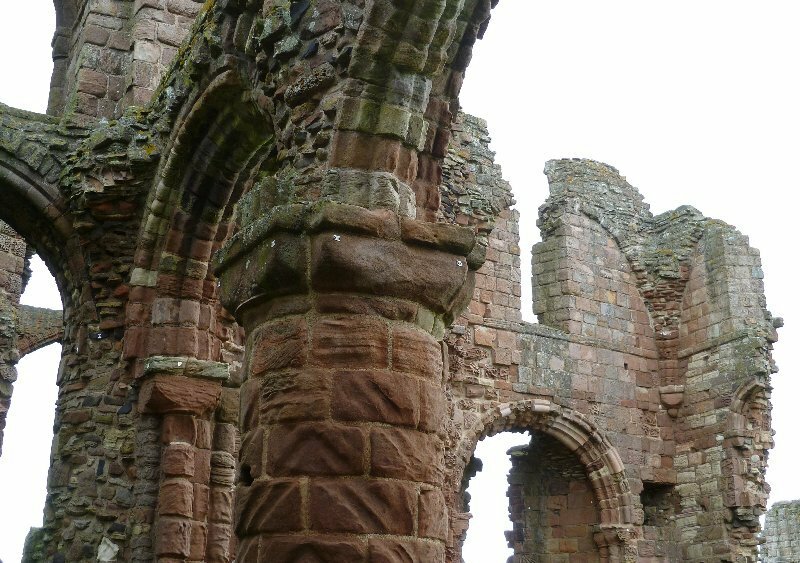 All of the visible ruins at the priory date from the Norman period. 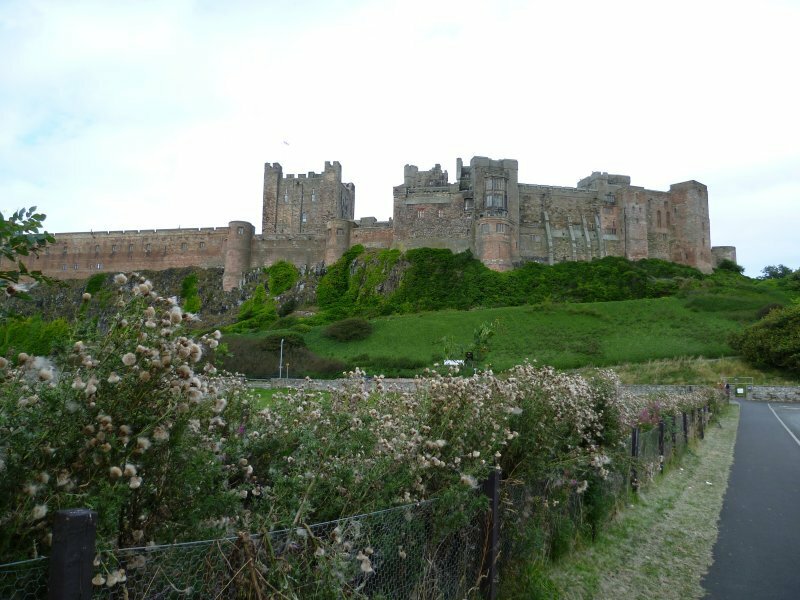 But with the tide already turned, it was time for me to continue my journey down the coast to Bamburgh Castle. 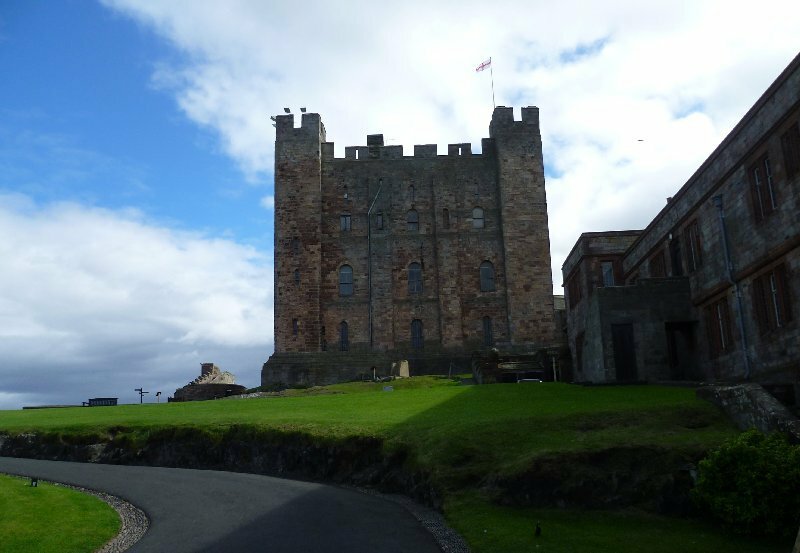 I’ve had a desire to visit this castle since reading Bernard Cornwell’s “The Last Kingdom”. 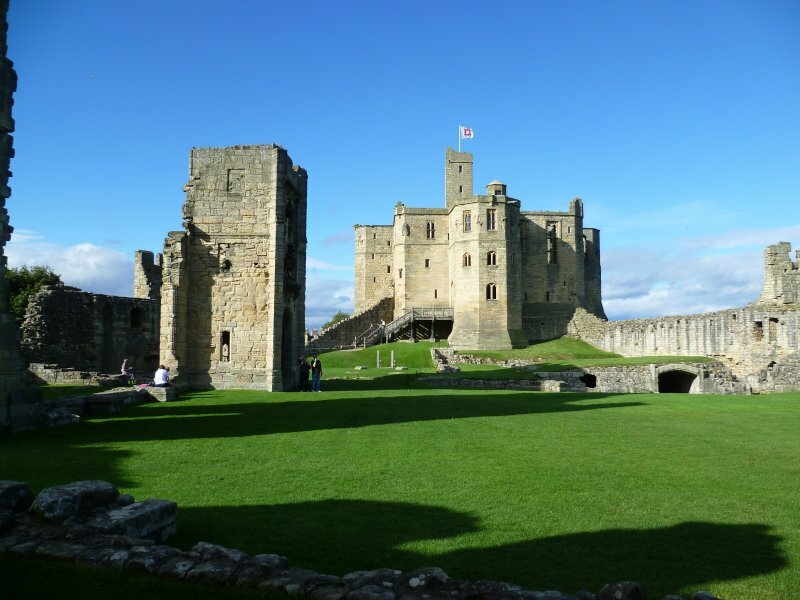 His leading character, Uhtred is the second son of the Lord of Bebbanburg, – the old name for Bamburgh, and Uhtred had been tricked into allowing his uncle to occupy the castle. It stands on a high promontory over-looking the sea. 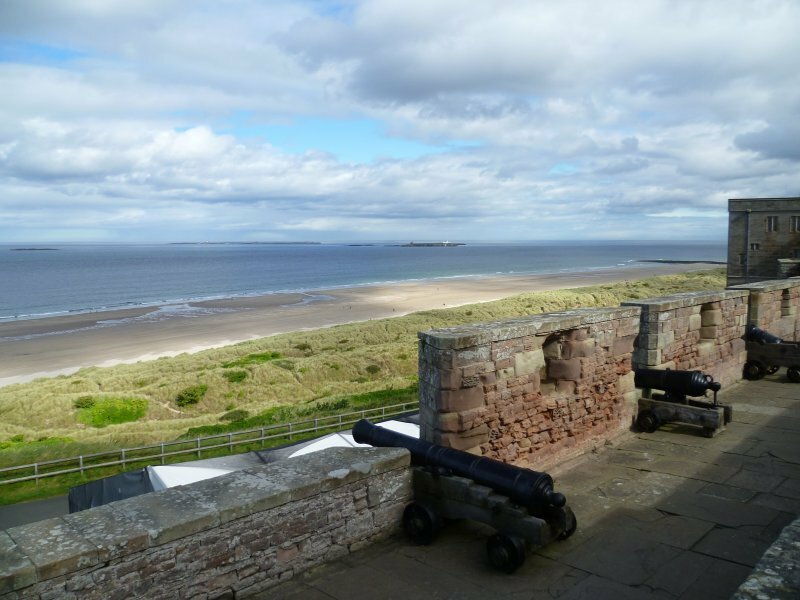 Looking out over the ramparts there’s a grand view of the Farne Islands with a beautiful sandy beach at the foot of the cliffs. 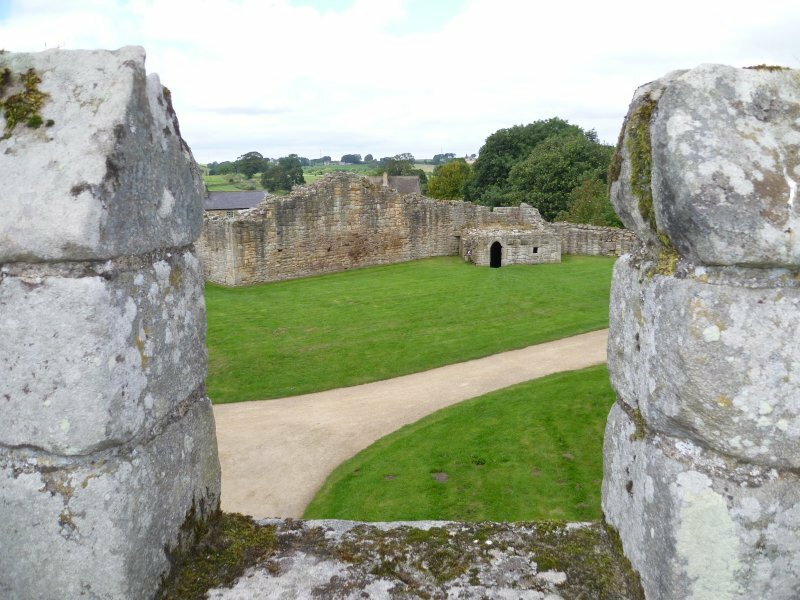 The castle is now in private ownership although much of it is open to visitors. 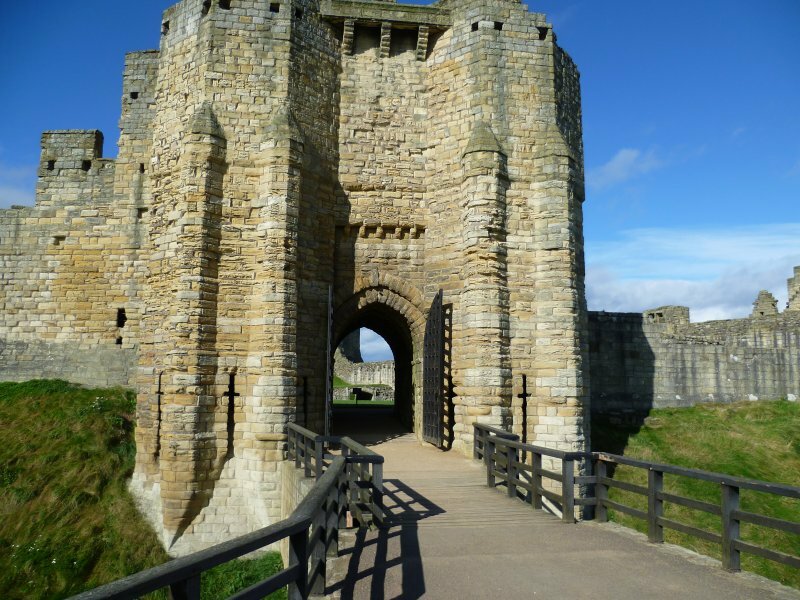 From Bamburgh it was back to the A1 before heading south but with another diversion planned to visit the Castle at Warkworth. There is some doubt as to when this castle was first built, however it is strategically placed in a loop of the river. 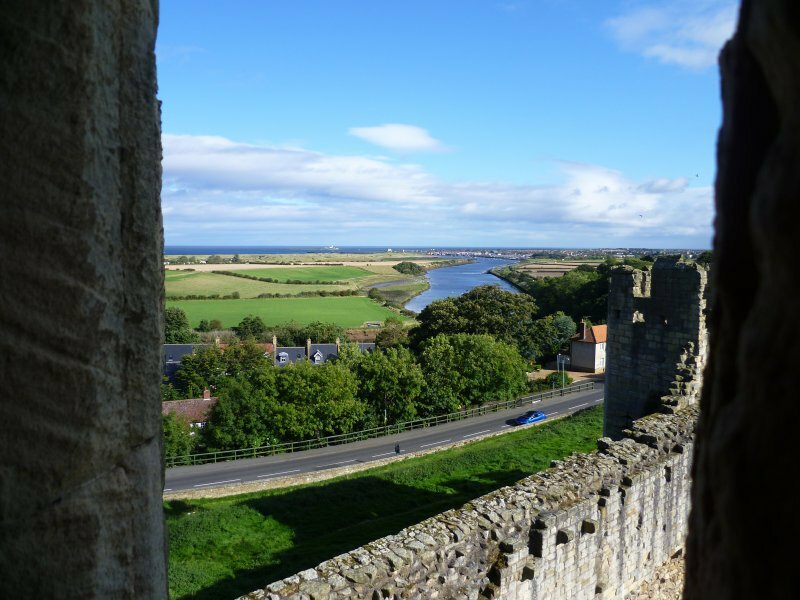 The powerful Percy family who first arrived in the country with William of Normandy acquired the castle is the 13thC when they became the Earls of Northumberland. It was during this time that the keep was built. There was only a short time in which to get around the large site. It had been a long day and with the castle about to close, it was time to head back to Durham. 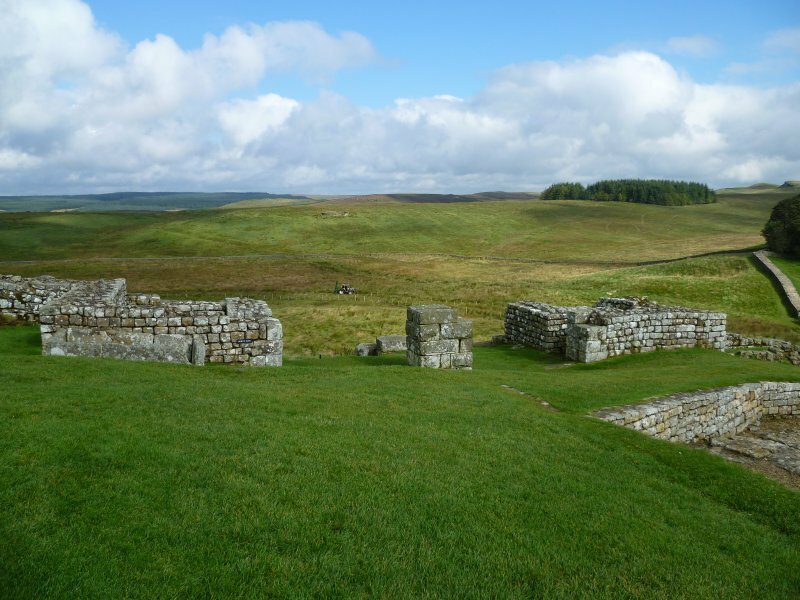 The weather was holding well so next day I set out to drive to Housesteads Roman Fort which is about mid-way along the length of Hadrian’s Wall. Tomtom ensured that I found the carpark and visitor centre easily enough, but then I was dismayed to find that the fort was a strenuous undulating walk which took me 20 minutes or so. This fort which was one of 16 built along the entire length of the Wall is sited on the edge of an escarpment to the rear of the Wall’s length. In its day it would have been home to 800 soldiers who had been conscripted from the lands where Belgium is today. After making my way down the hill and back to the car I made my next stop at Aydon Castle, which isn’t really a castle but a 13thC fortified manor house. It’s open to the public and I went in for a look around. 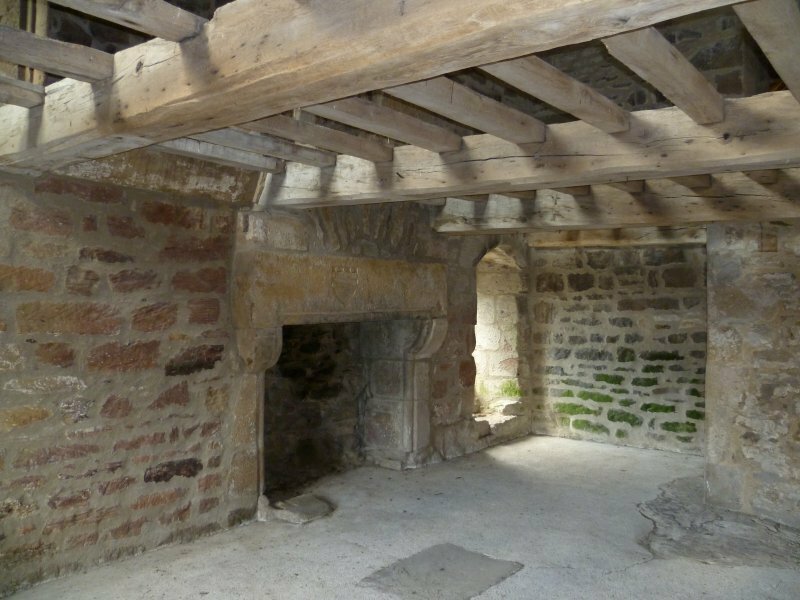 There are some beautiful fireplaces to see together with huge timber beams and flooring joists. 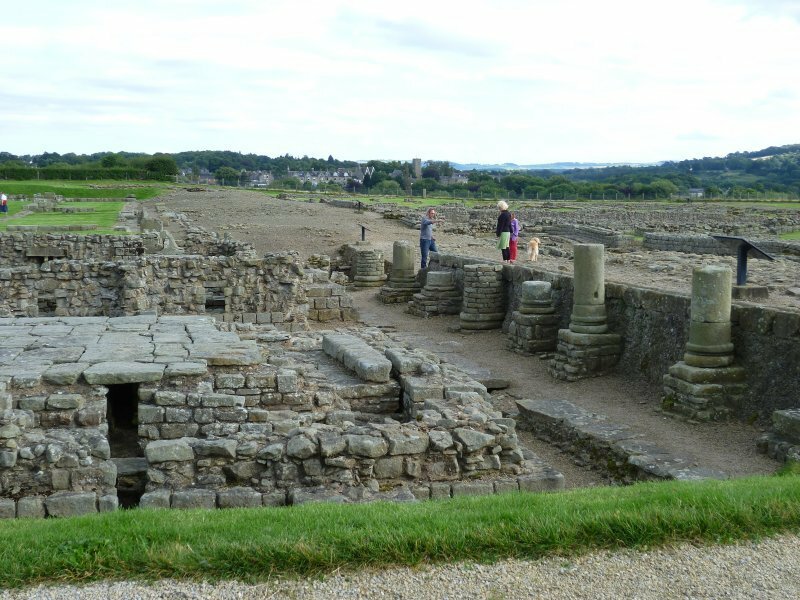 My next stop on this day’s tour was at Corbridge Roman Town. 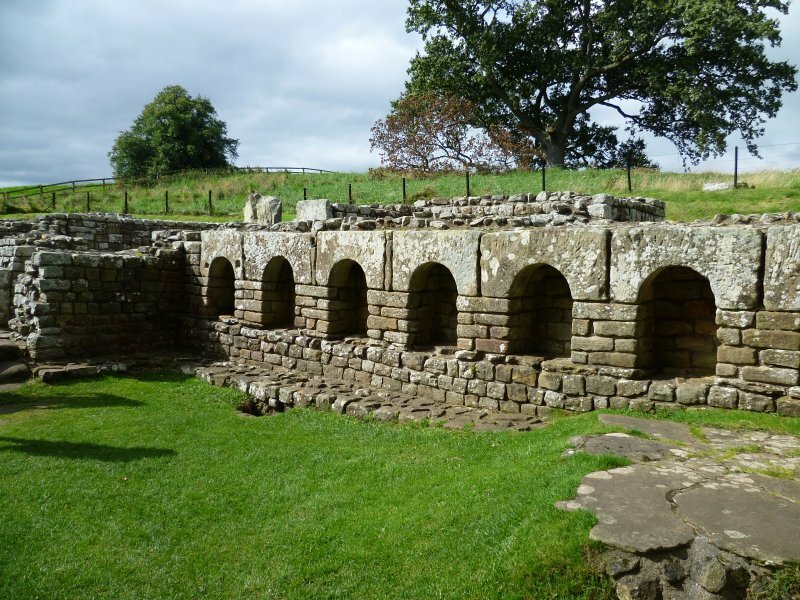 This was originally built as a fort at the junction of two roads 2-3 miles behind Hadrian’s Wall, but later the fort was demolished and the site grew into an important township. Amongst the ruins there is evidence of large granaries and what would have been imposing buildings. It had been an energetic day, so it was back to the Grange. I decided to leave the car on site and take the Park&Drive into Durham. I offered the driver my fare, but he asked if I had a bus pass. I did, so that was accepted. The journey into Durham didn’t take long. I then set off to walk along the river footpath, thinking it would lead me towards the Cathedral, but I soon realized that the cliff top was getting higher all the time. Eventually I found a footpath which wended its way backwards and forwards to the top. What a strenuous climb it was. Fortunately some seats gave me an opportunity to recover before making my way round to the cathedral’s west end. But then there was disappointment. On the lawns facing the west end there were erected large marquees with crowds of young people decked out in their caps and gowns with proud mums and dads clicking their cameras. I’d chosen a day when the Cathedral was closed to the public. However I did just manage to get a quick peek inside. 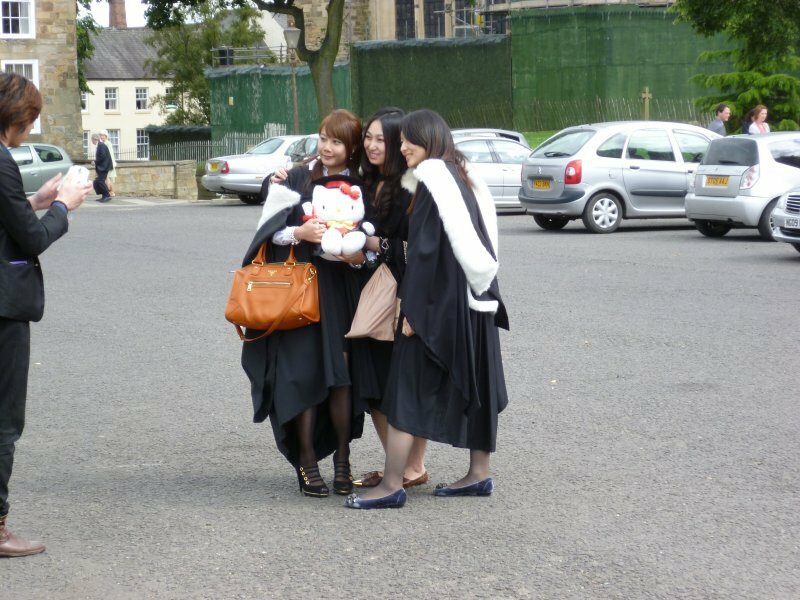 Durham University must offer something special to foreign students. I’ve never seen so many Japanese all in one place. 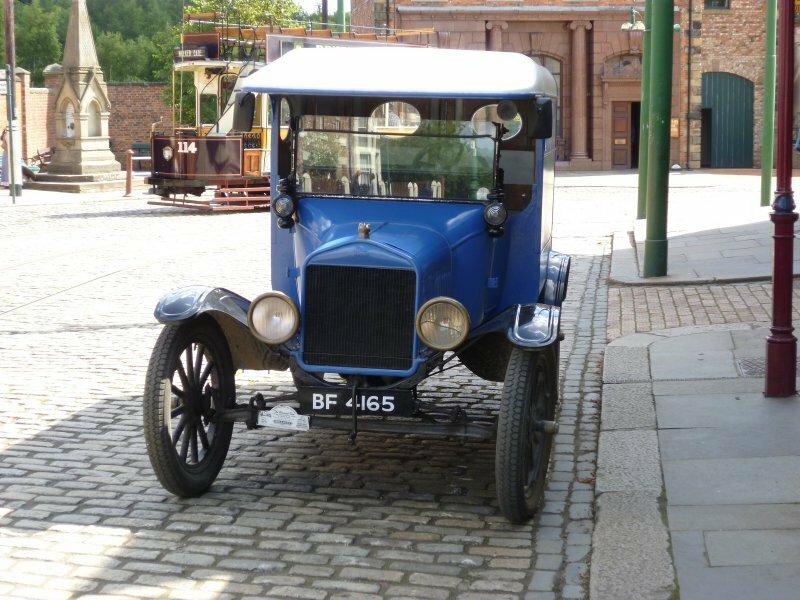 Next day I took the short drive up the A1 to Beamish Museum. 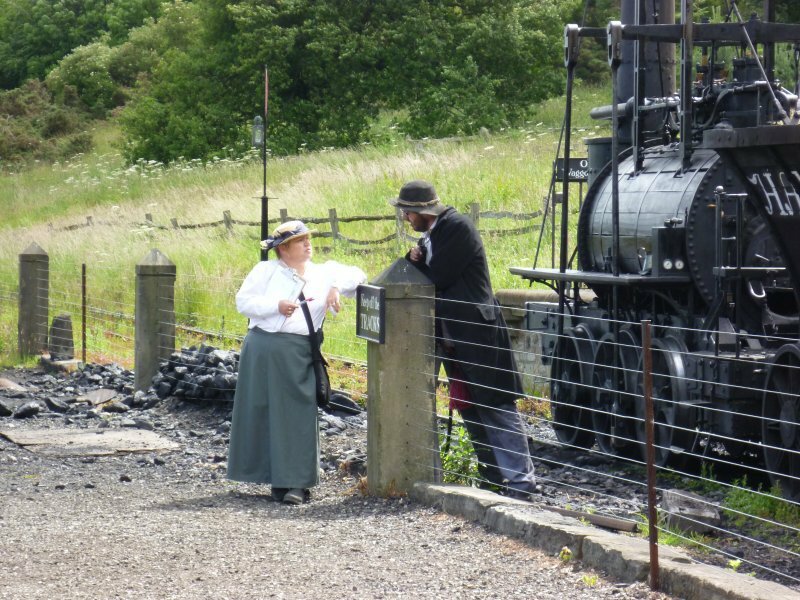 Beamish is not a museum in the usual sense. It’s an open-air attraction covering a huge area. 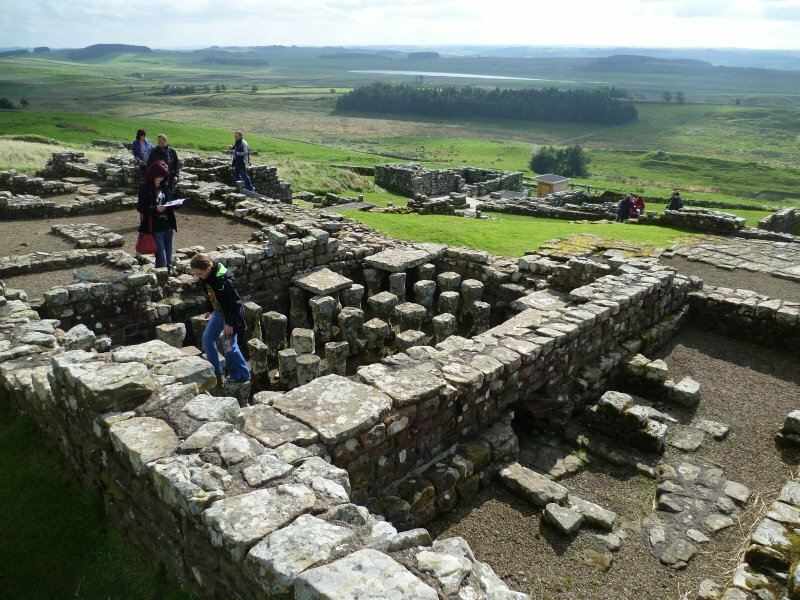 Although it all looks authentic, nearly everything has been carefully dismantled and brought in from other places in Northumbria. I arrived sometime before opening so I chose a parking spot quite close to the entrance. To my surprise I was handed a ticket which I was told would allow me free entrance for a full year. 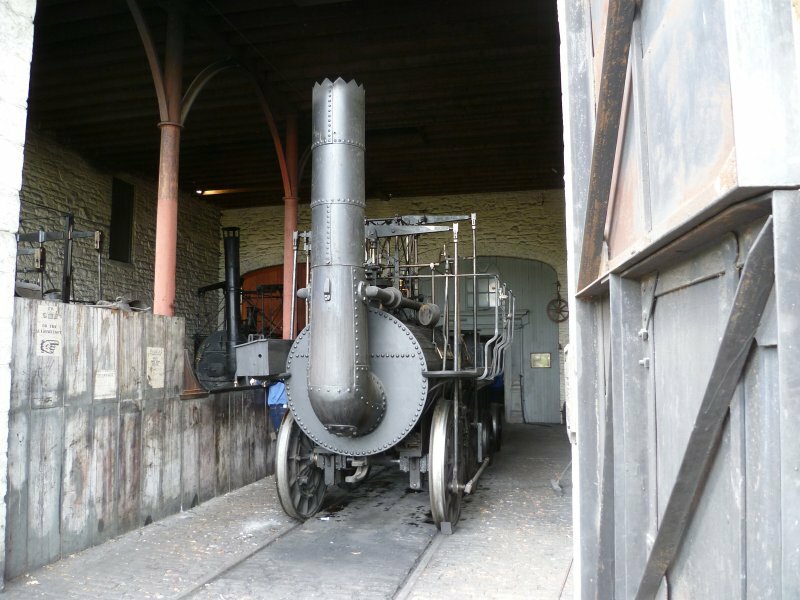 Once through the entrance building you step back in time. In fact to the time of my youth. A short walk from the entrance building brought me to the tram stops. There were two trams waiting, going in different directions. I climbed aboard. 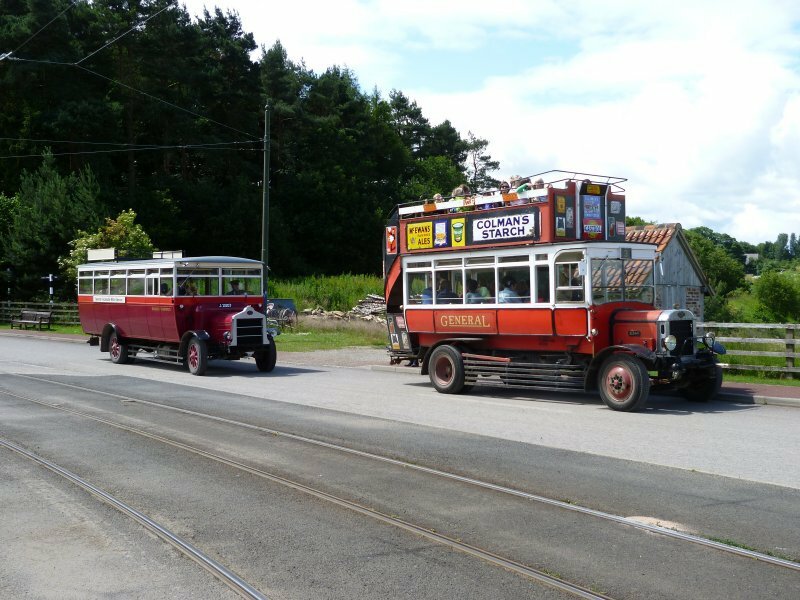 After driving through the countryside, passing other trams and open topped buses, we arrived at the town where most people got off. 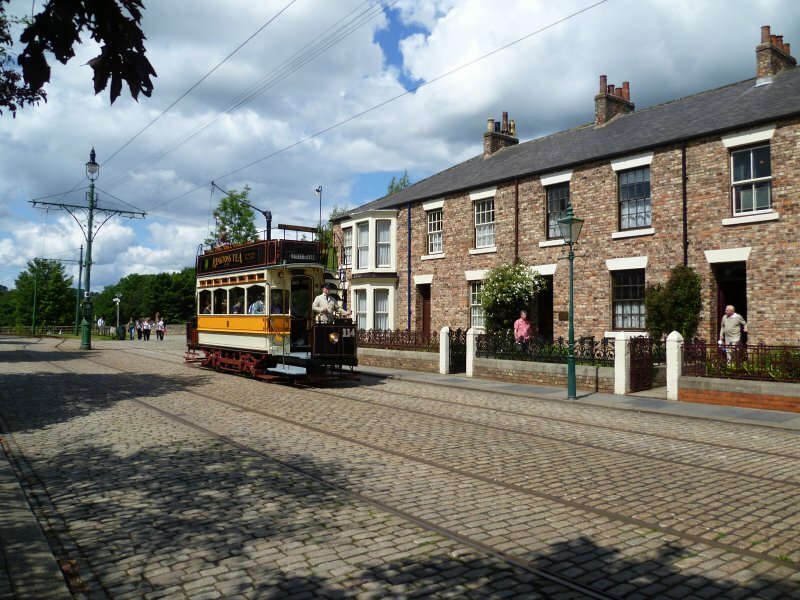 Across the road from the tram stop was a row of terraced houses. The first one was the dentist’s house so I went in through the open door and eventually found ‘the dentist’ in his surgery surrounded by all his antiquated equipment. 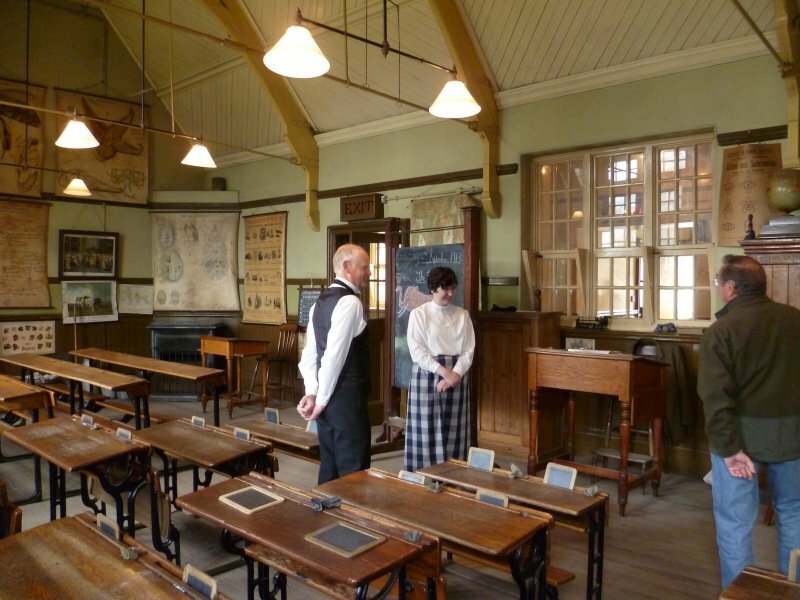 In the house next door was the solicitors office with its huge mahogany desk, ink pens and paraffin oil lamp, and the house after that belonged to the music teacher. Further along the road was the waggoner’s premises and stables. Across the road was the motor works with a fine looking Ford Model T standing outside and next door, a Coop store, much the same as I remember it as a boy. 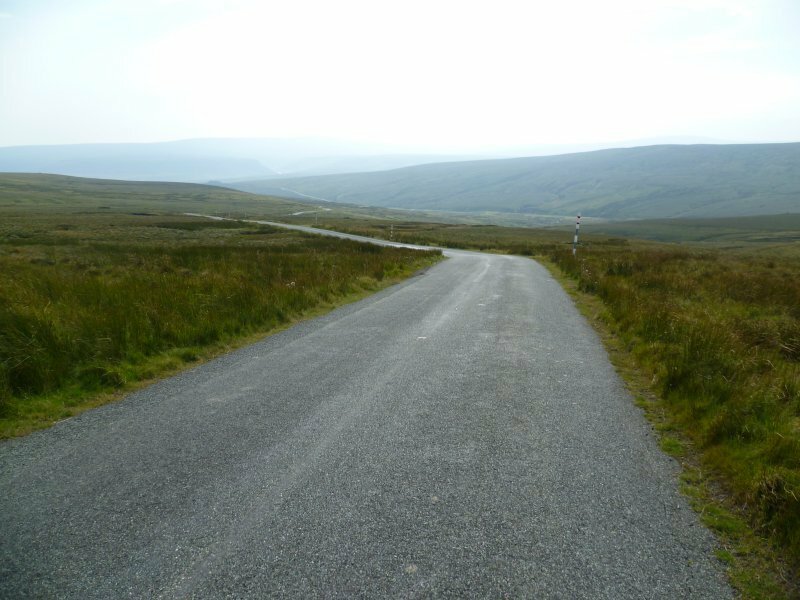 At the end of the road is a park with it’s grandstand – a familiar scene to those who have watched some Catherine Cookson TV stories. After another ride on a tram or bus you arrive at the pit village. In one of the cottages was a woman doing some rug making. Exactly the way I remember my grandmother doing it. And out in the back yard was the toilet. Simply a wooden box which it would be someone’s unenviable job to empty from time to time. Across the road was the chapel and school. Another bus ride and a walk brought me to Pockerley Old Hall, a Georgian farmhouse with a beautiful garden. Taking a rest on the seat at the far end of the garden, there was a fine view across the valley to where an early steam train was chugging its way along the line. With lots still to explore, I felt I’d walked enough for one day. It was time to return to my car and get back to Durham. 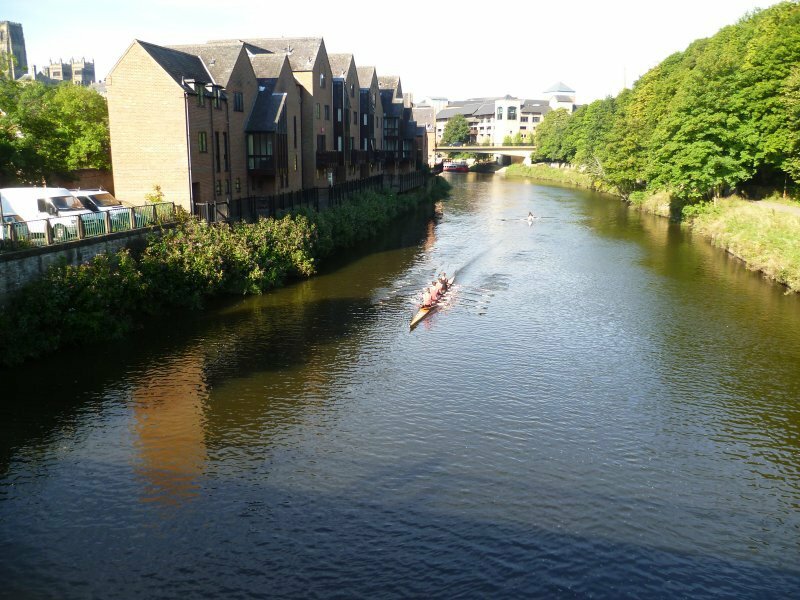 Sunday…………….I packed up some lunch and I loaded my bike into the car and drove the short distance into Durham. I had expected to find parking easy early on a Sunday morning, but not so. It took quite a bit of driving around before I found a place. The spot was close to the river so I got out my bike and set off along the river-side path. It was a delight to be riding alongside the river, sharing it with the early morning joggers with the backdrop of cathedral and castle in the distance. After two or three miles, I turned and returned to the car. 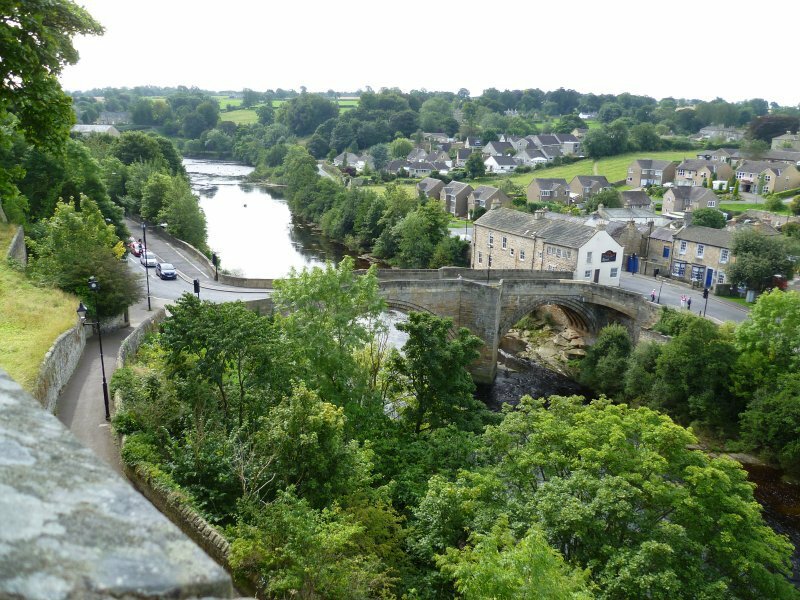 I then set off on the 20 mile drive to Barnard Castle and found a parking place close to the Castle. I used my English Heritage card to get me in. 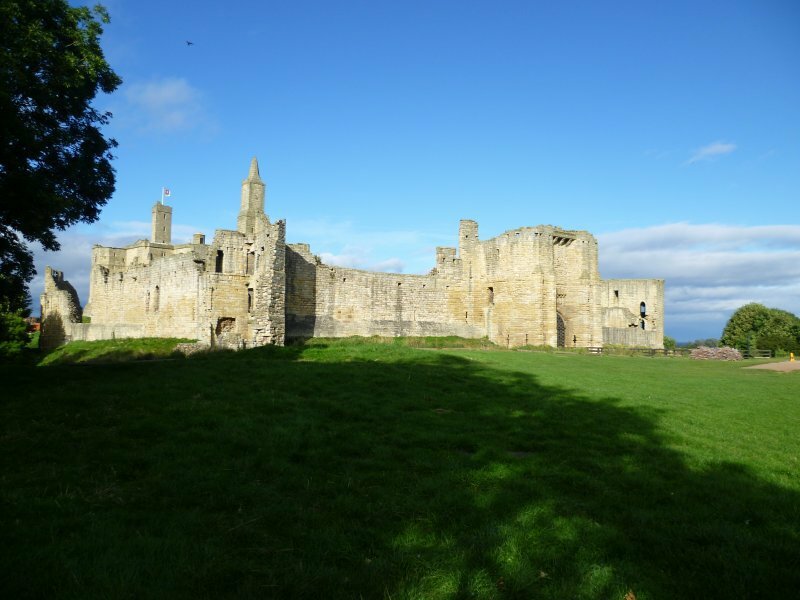 The first castle built here was of wood, but in the 12thC Bernard de Balliol rebuilt it in stone. He also gave his name to the town. 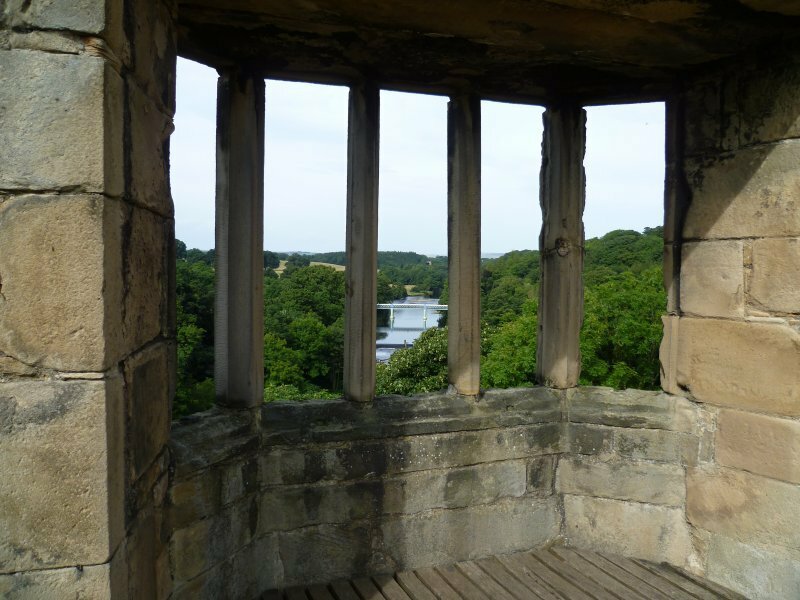 The castle stands on a high rock overlooking the town and the River Tees. 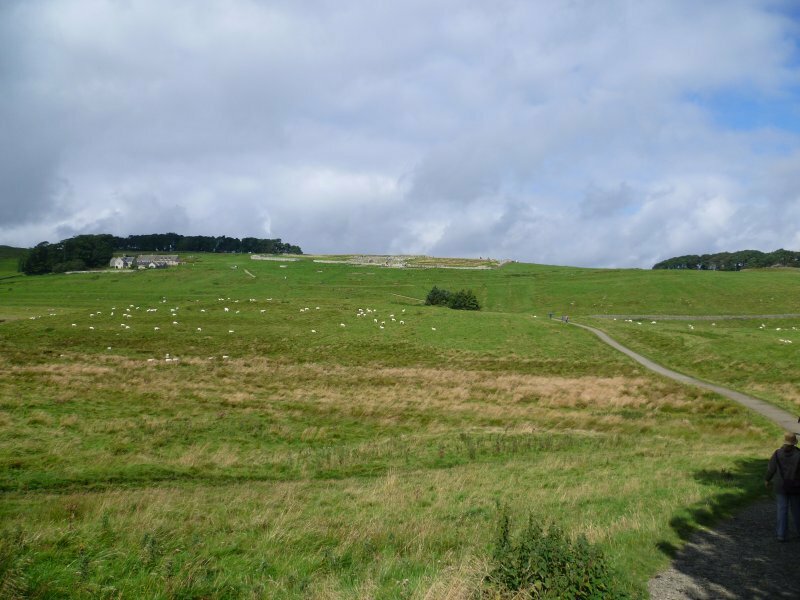 From Barnard Castle I drove over the moors to Baldersdale Reservoir. This visit has been on my ‘wish list’ for many years. Thirty-five years in fact. 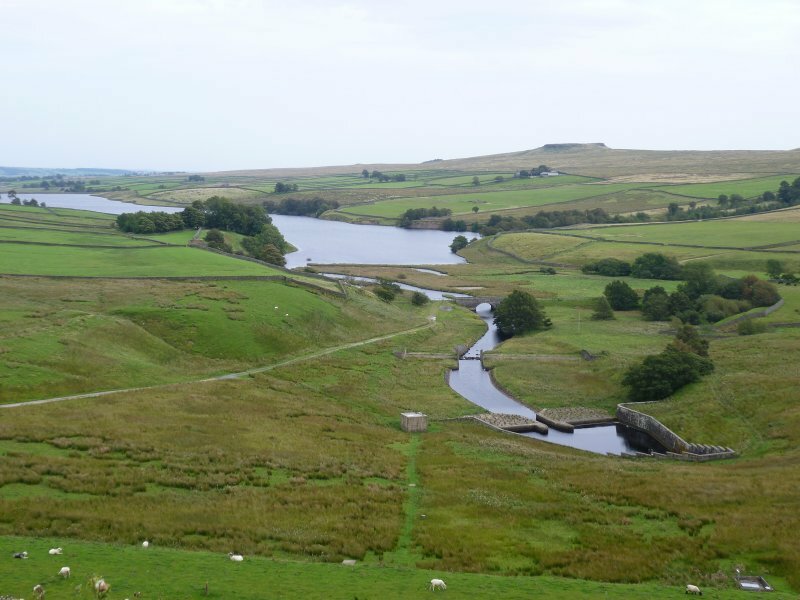 Ever since seeing a TV documentary about Hannah Hauxwell, a farmer who had lived all her life on the farm situated on the banks of the reservoir. Her house was without electricity or running water. After her parents died she ran the farm single-handedly and led an unimaginably hard life during so many Pennine winters. On the day I was there weather conditions were much more pleasurable. I found a quiet parking spot, got out my sun lounger and had a picnic lunch. 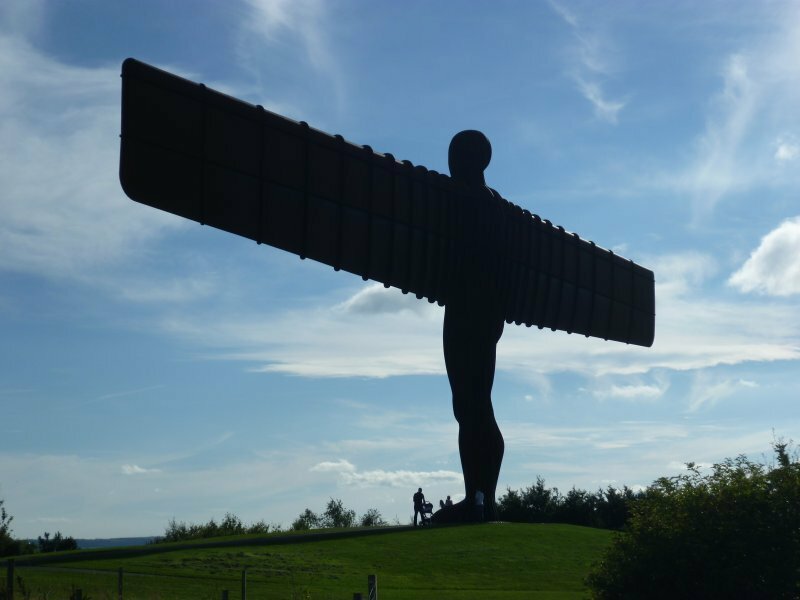 On Monday I drove up the A1 then across to South Shields. 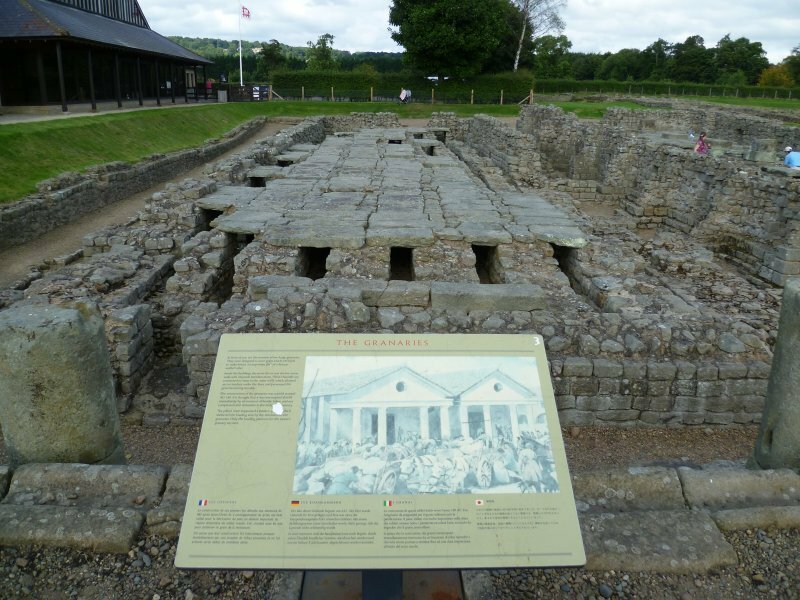 I wanted to see the ruins of the Roman Fort which once stood there. Imagine my surprise to see a fully functioning gate house. A replica of course, built on the foundations of the original. 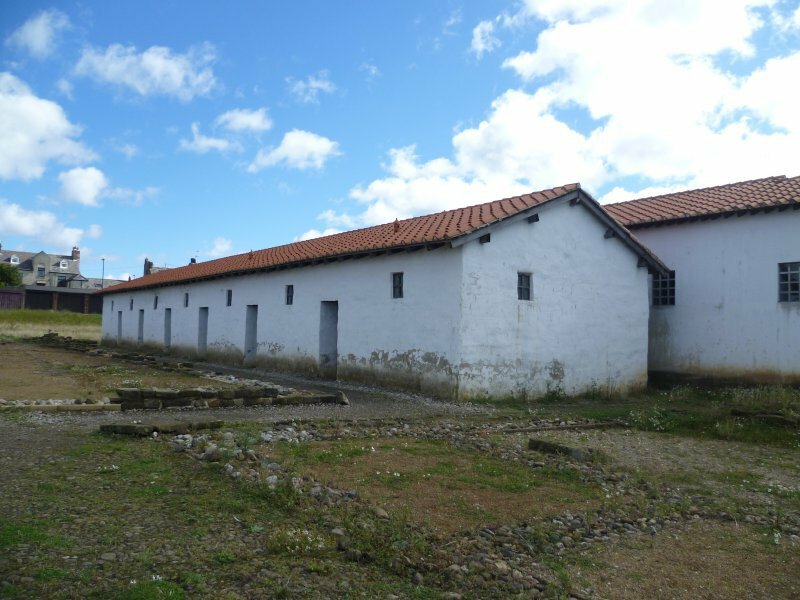 Once inside, there was also the soldiers quarters rebuilt and the Commandant’s house and sleeping quarters. 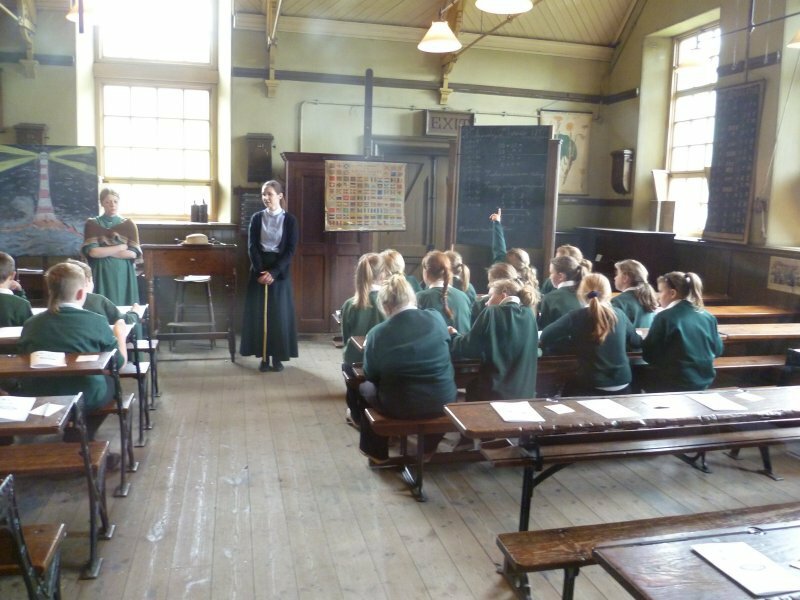 The complex is in the care of the local authority, so it is used as a living classroom for local schools. Later in the day I crossed the river to visit Tynemouth Priory and Castle. 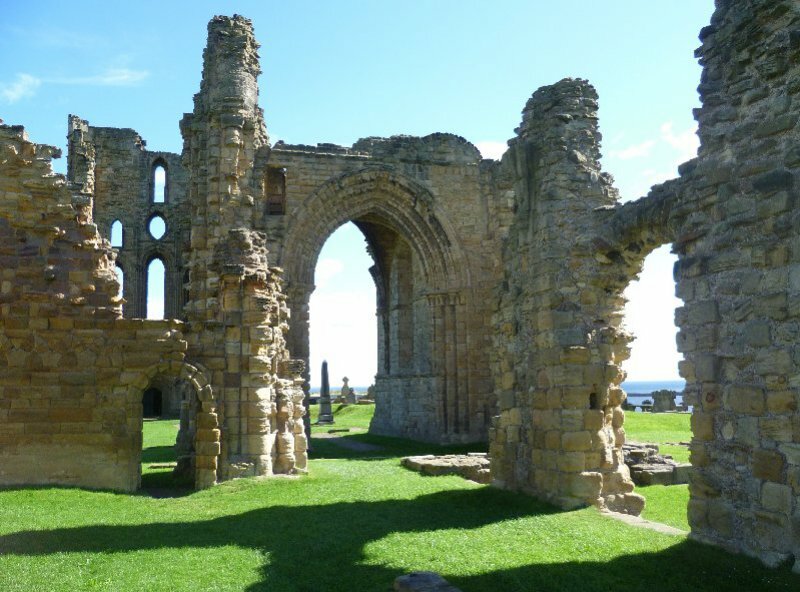 Like Lindisfarne, Tynemouth Priory often came under attack by the Vikings with monks and nuns being killed and buildings ransacked and destroyed. 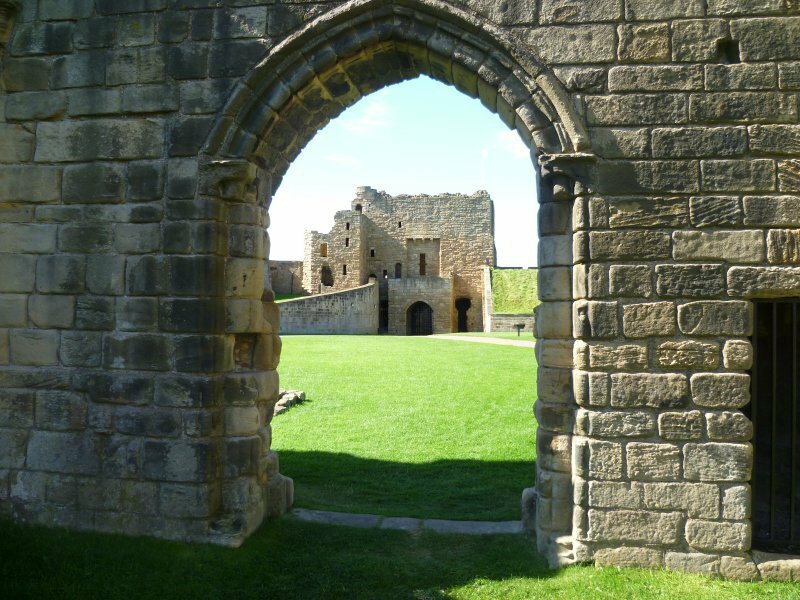 The castle and priory were rebuilt after the Norman Conquest and existed until the reformation. Tuesday –—– My last day. What should I do? 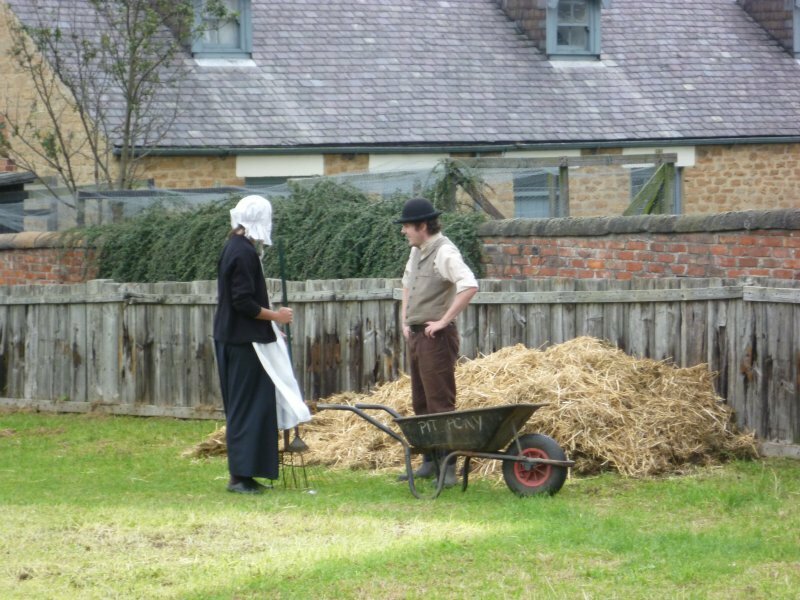 I decided to return to Beamish Museum. Like last time, I was there well before opening time so I parked in the first parking area. Last week’s ticket got me quickly waved past the admission desks. 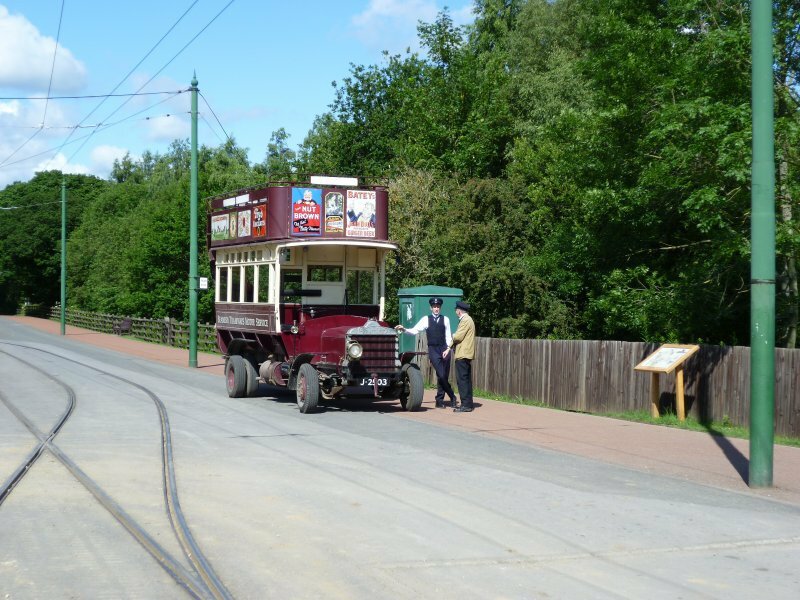 First I boarded the tram to the town, then the bus to the pit village. I joined a group who were waiting to ‘go underground’. First we were kitted out with safety helmets – which I thought was a bit unnecessary. But not for long. 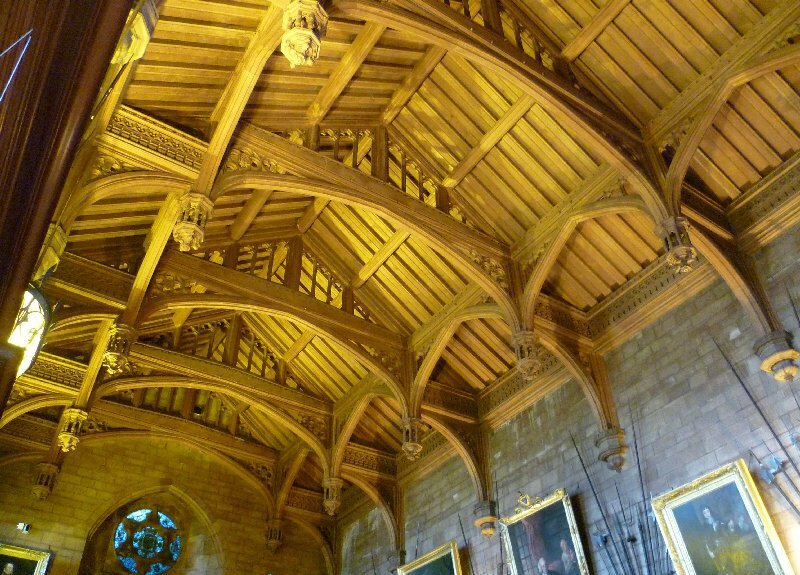 With a roof beam every four feet, at a height of just five feet, I quickly lost count of the number of times my head would have made contact with the roof timbers. 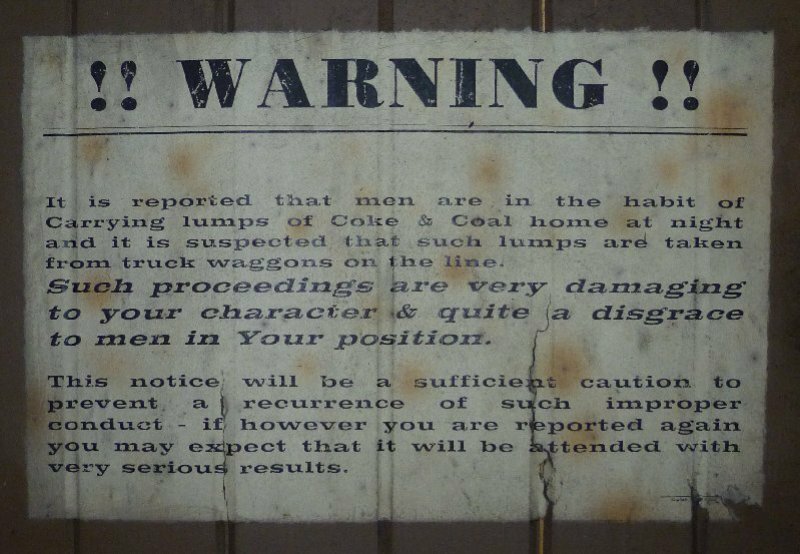 Very interesting……….. but I was glad when I could get out and stand up straight. I took the bus again and returned to Pockerley Old Hall and had a closer look at the farm buildings. 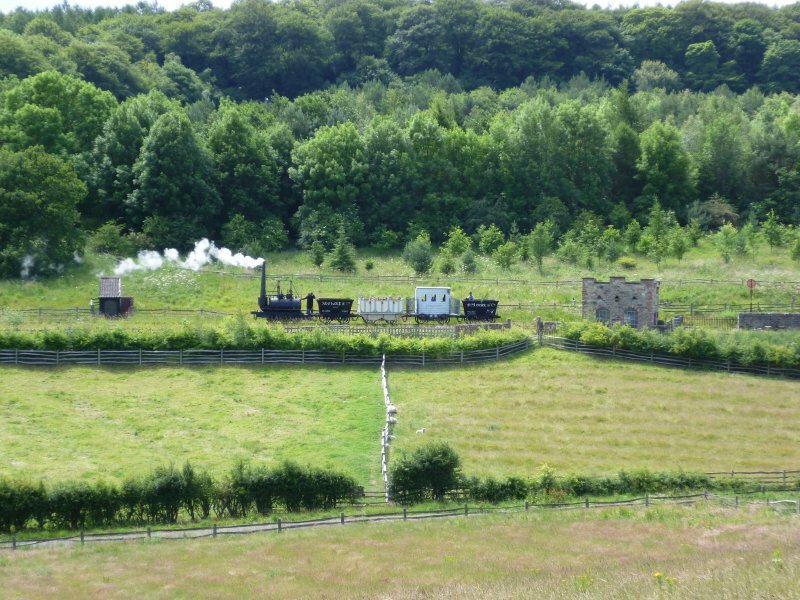 Then I walked down the hill to the engine sheds. One of the engines was out on the line coupled up to some old carriages. After a few minutes wait, the train set off along the valley floor for a few hundred yards, before returning to the station. One last visit back to the town gave me an opportunity to visit the bank – just such an establishment that I remember from my younger days. 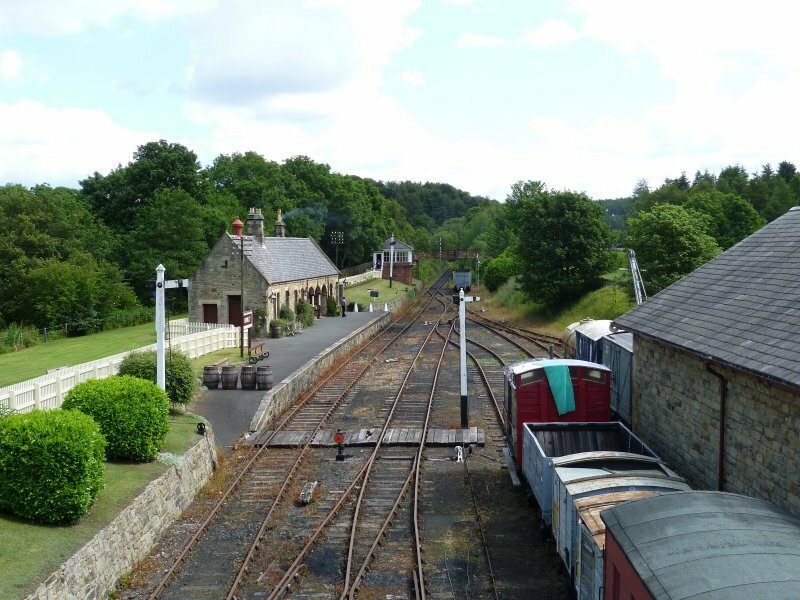 Then after a quick visit to the railway station, it was time to find my car and return to Durham Grange. On the way back to Durham I took a short detour from the motorway. 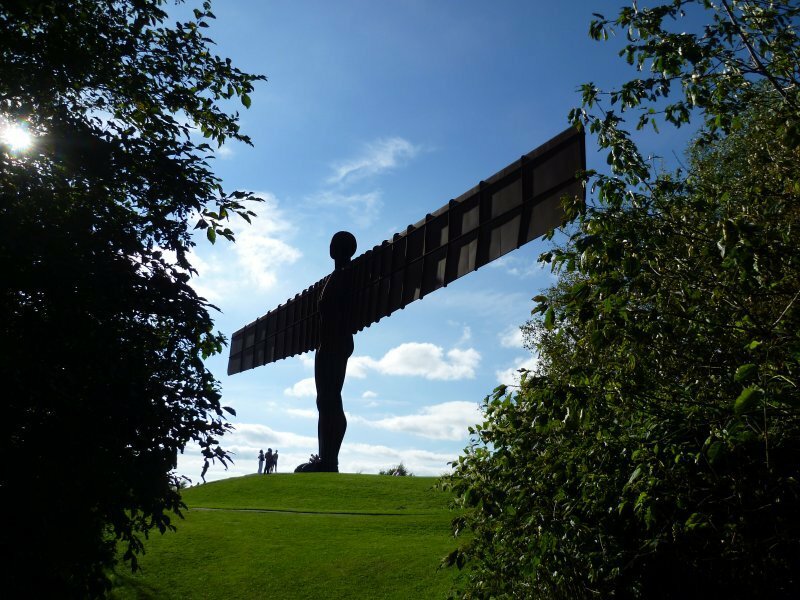 Each time I’d travelled along the A1 I couldn’t fail to see the Angel of the North standing tall on it’s hill. I took an exit at the junction and found a layby quite close to the park where it stands. After a walk around the statue and some pictures, I returned to the site to take down my porch awning and prepared for a morning departure for home. 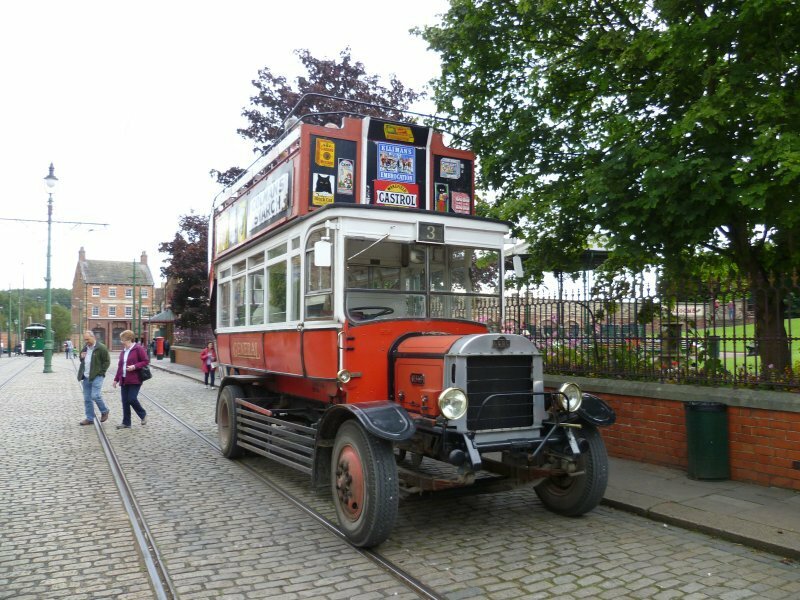 We are hoping to make it back to Beamish in early September to get in a second visit before our year’s ticket runs out. We thought it was wonderful. 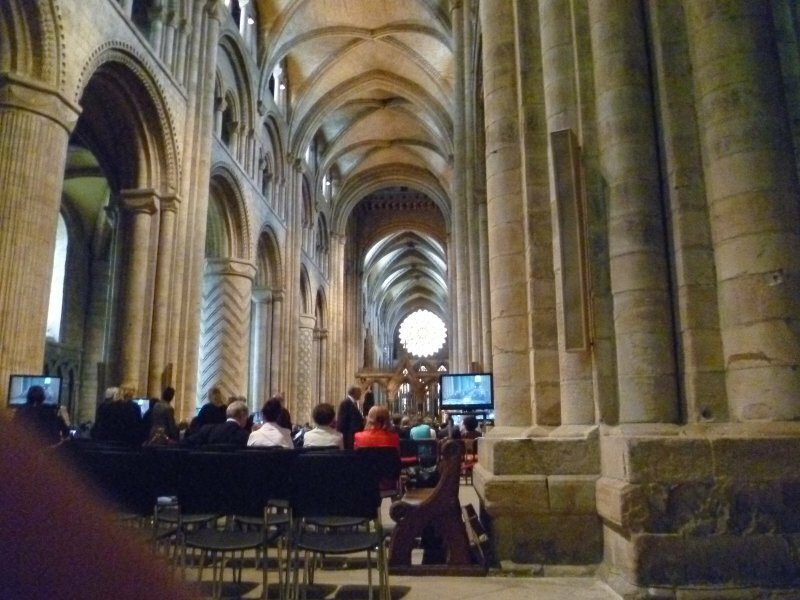 Also hoping in the same trip to get to York Minster before that ticket runs out. So many places to go and things to see! 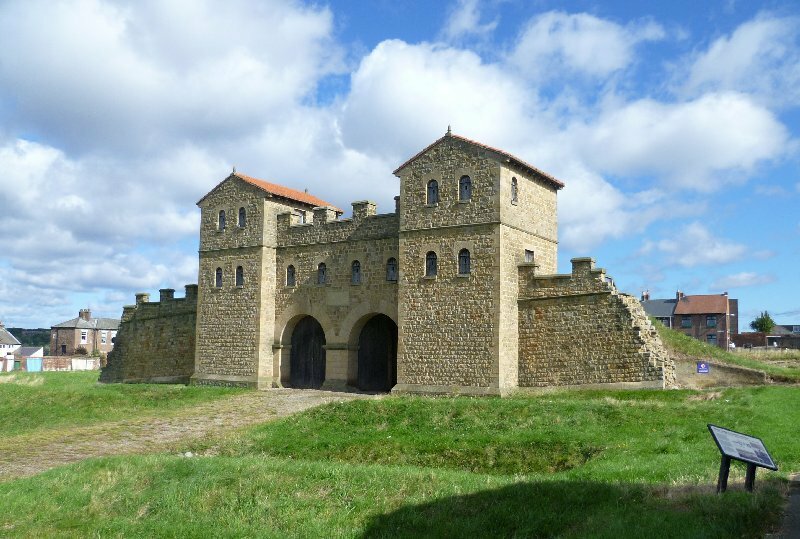 We have thought about staying at Durham Grange but have always been put off by the road noise reports. I suppose we are especially sensitive about noise as we live in a country village and our house is well away from the road. Lucky you! 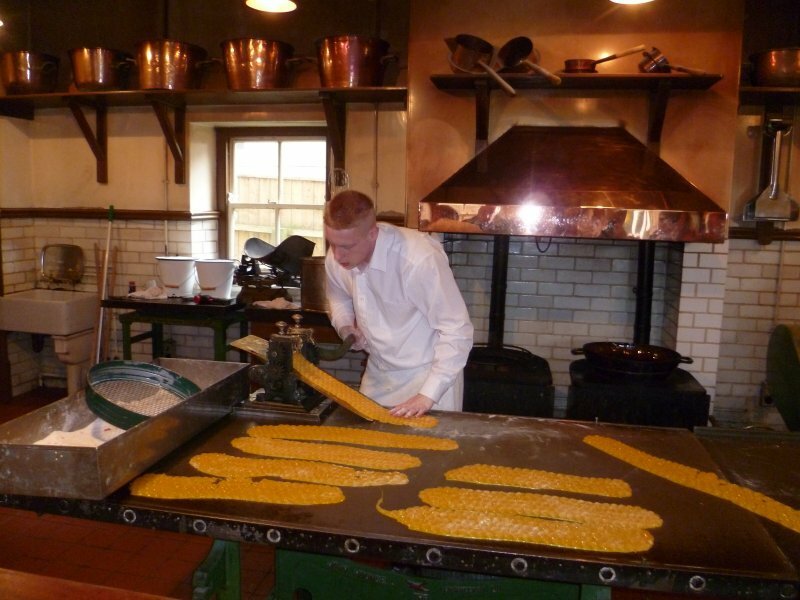 I love Beamish. It’s like a walk down memory lane from the days of my childhood. And so handy to travel to from Durham Grange. I didn’t find the traffic noise a problem since I was pitched well down the site. Then again my partial deafness may have helped!! My plans for later in the year include a stop at a CL in Chirk, however having read comments in your blog, I may need to have a rethink. Maybe Lady Margaret instead. My comments on the Cl we stayed at Chirk on the reviews of the CL on the club web site were a bit more explicit regarding the unpleasantness of emptying the toilet. I don’t recommend it! Its a pity as we had thought of using Lady Margaret and decided to go for a CL. I am glad of your comments regarding the road noise at Durham as John is a bit deaf as well. It is perfectly situated for what we want to do so perhaps we will give it a try. Thanks for that. I’ve already decided to try Lady Margaret as a first preference although I don’t usually book until the last minute. We’ll see!